You curse silently (okay, not so silently) as your ATV hits an oil slick, spins out of control and slams into the guardrail. The rebel car that's been tailing you takes full advantage, and rams you broadside. You regain control of your vehicle and blast the rebel with a shell from your forward-mounted cannon. A glance at your damage indicator tells you that repairs are needed. You know where the nearest gas station is, but first you'll need a supply of food to exchange for services and goods. You'll have to risk a trip inside one of the buildings. You know that in the buildings you can find food, gas…and hordes of "green, slimy mutants." Better make sure you've got plenty of ammo for your sidearm. You'll need it. Road Raiders is one of the latest offerings from Mindscape, set in a post-disaster world. This time, the disaster was a food shortage, combined with the invention of the Slu food substitute, a substance which, the world discovers too late, turns anyone who eats it into one of the aforementioned green, slimy mutants. Your role is that of bounty hunter, and your quarry is Dr. A. Noid, sly inventor of Slu. Road Raiders comes on two disks, one of which is copy protected. A color monitor and joystick are required. Neither hard disks nor RAM disks are supported; a serious omission as we will see later. The graphics are fairly well done. I especially like watching the mutants clamber out of their holes, and your on-screen persona has a sort of one-too-many-car-wrecks limp as he runs. It fits in with the whole Mel Gibson/Road Warrior gimmick. The backgrounds are nicely detailed; many an "Eat Slu" sign can be glimpsed as you fly past in your ATV, and the insides of the buildings are littered with empty cans and boxes, which add to your challenge as well as to the ambience, since you must maneuver around them. The controls are straightforward with almost everything accomplished by joystick, except for firing your smoke screen (spacebar), and housekeeping commands such as Save, Restore and Mode, the latter of which is a nice added feature. In Mode 1, your joystick is used in the usual driving way: forward increases speed, pulling back decelerates, and left and right turn your car accordingly. I prefer this mode as it has a nice driving feel to it, especially when you take a corner at high speed and your vehicle fishtails realistically. Mode 2 is more basic. It controls your car through the streets like Pac-Man through his maze. Point the stick and the car goes in the corresponding direction. But, as Shakespeare's Hamlet said, "The play's the thing." And I have news both bad and good to report. Let me get this off of my chest. The disk access is horrible! It takes approximately 30 seconds to load the screens every time you enter a building, and the same to load the roadway screens when you leave the building. The gas station is a bit better: about ten seconds to enter it, and 20 seconds to leave. This wait may not seem too bad, except that you are often ducking into a building, grabbing some food, driving around the corner to a gas station, buying some ammo, then driving back and re-entering the building. The long load times break up the flow of the game. On the positive side, all the mutants "reset" when you leave a building, so this feature may dissuade you from being tempted to bend the rules a bit by bobbing in and out of the building every time things start to heat up. Let me get up on my soapbox. First, if you don't own a hard drive, then maybe this disk access thing won't bother you too much. But as any other hard-disk owner will attest, once you have one of these beasties, you immediately become spoiled by the decreased load times, and anything loading off a floppy irks you. Why Mindscape couldn't have supported hard-disk users is beyond me. If copy protection was the concern, then, by all means, leave Disk A protected and use a "key disk"-type scheme. But let us load our data off of our hard or RAM disks! End of lecture. A couple of other faults. You can save your game, and you will have to use this feature. The problem is, you can only save one position on your data disk. The data disk is not copy protected (although nowhere in the documentation is this mentioned), so do yourself a favor and play the game with a back-up of this disk to avoid the risks of writing to an original. Fault 2: Occasionally, the program will miss a joystick input. This inevitably leads to driving into a brick wall, or walking into an open pit. 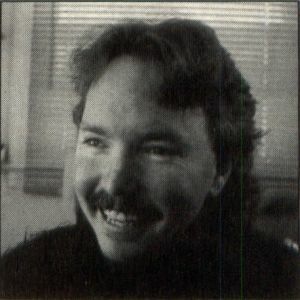 Strange though, as much as I griped about the disk access to my much-suffering computer widow, I kept slapping those disks back in, and leaving this world for the one of Road Raiders. I found driving through the maze of streets fun. You have to watch the land mines, of course, and the ever present rebel cars. And the inside of the buildings made for a nice contrast. Make no mistake, though. This is no game for the too-much-violence-in-video crowd. The mutants come at you endlessly, and the only way through is to lay about with whatever gun you have handy. The arena is something totally different, and not at all what I expected to find. Rather than a reckless demolition derby, it can be delicate work maneuvering around deadly crevices while trying to smash enemy vehicles. Add to this such goodies as time bombs and trap doors, and you'll be short a few patches of hair before you make it through. After defeating the master of the arena, you will gain admittance to a second, more difficult city. Altogether you will visit three cities and three arenas in your hunt for Dr. A. Noid. 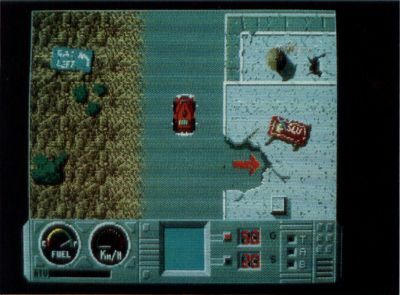 Road Raiders is basically an arcade game with a hint of adventure thrown in. You'd do well to map the city streets, and each building will take some time to explore. Also, while you don't improve personal attributes, as happens in fantasy RPG's, you can improve your weapons and vehicle. Add-ons include radar, a smoke dispenser and battle armor to name a few. There is also an economic side to the game. 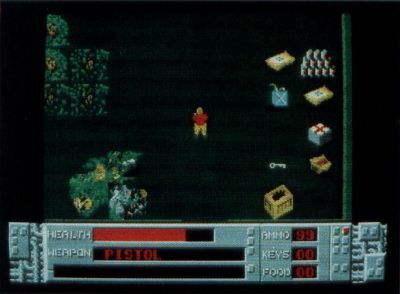 While you may sometimes find extra equipment, usually you will have to buy the equipment with food, which is found lying about in the mutant-infested buildings. You'll have many tough decisions to make, such as when your ATV needs both repairs and fuel, but your food supply is such that you can't afford both. Also, the advanced weapons cost big… um…calories, so you'll have a tough time scraping up enough leftovers (sorry) to buy them. All in all, I would wholeheartedly recommend this game, if it were not for the problem with disk access. I have written to Mindscape about this failing, but to date they have not replied. If you are a big Road Warrior fan, or if you like a game that mixes arcade action with some simple adventuring/role-playing (and you are the patient sort), buy it. Peter Smith lives in Sag Harbor, New York, with his wife and in-house editor, Julie. When not in front of his computer, he is a bicycle enthusiast, a struggling musician and a poet. He can be reached on GEnie at the address Capt.Cook.